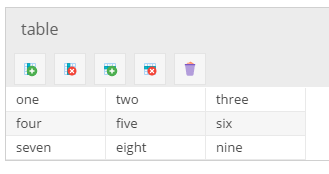 The table widget can hold structured data in the form of an array. The input widget for table data is a table with variable rows and columns as shown below. 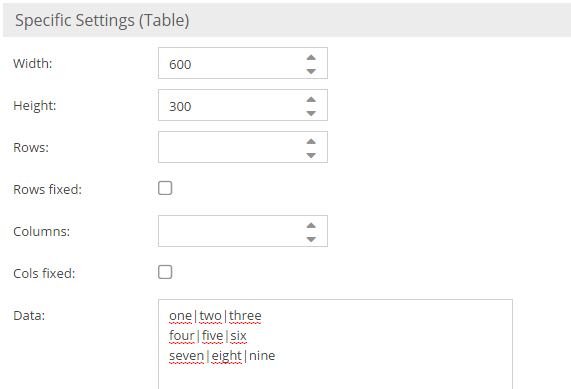 The input widget can be preconfigured with default data or a fixed amount of rows and columns. The default amount of rows and columns, as well as the default data, can be changed later when the data is entered. It's possible to prevent adding/removing additional rows/columns by setting the "Rows fixed"/"Cols fixed" checkbox. If this is set to fixed the add and delete button for rows and columns will disappear.